Beyoncé. A household name and an empire built by the Queen of #girlbosses. Beyoncé is definitely a definition of success. Now ask yourself: How can I brand my business like Beyoncé? She must be doing something right with the way her business is operated, right? There is so much truth in the fact that Beyoncé runs an incredible and successful brand that everyone should take notice of and learn from. 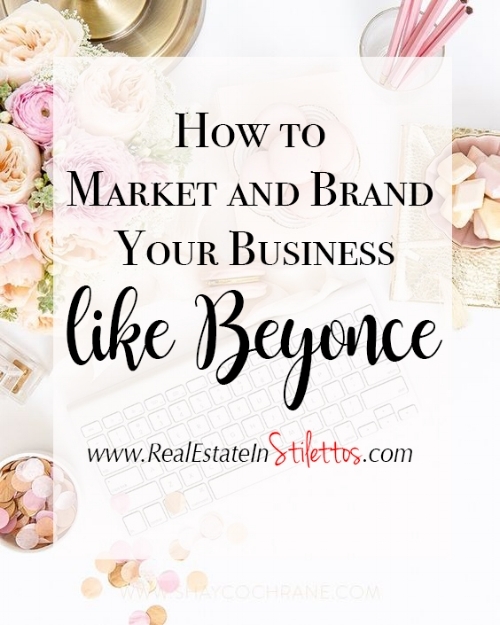 I've done some research and ready to reveal to you a few things you can do in order to market and brand your business like Beyoncé. I can’t stress enough how building a community online can be the life or death to your brand. Over the years, Beyoncé has built a strong empire of followers that are always ready to purchase her product, follow her no matter what and are ready to support her if she ever needed it. Running any type of business needs a great team to be successful. You can't do it all and still be really successful. Your social media community, support team and marketing teams all play a part in building your empire. Build a loyal and authentic following on Social Media. You need to get your audience excited about your product in some way. You can do this by creating a buzz around your e-book, course, product, service or website release. When Beyoncé released her “Lemonade” album, there was a huge increase in the use of Bee and Lemon emojis on Twitter! This means that you should use all social media channels to ensure you are reaching out to your fans. Don’t do what every another entrepreneur is doing, otherwise, you are just like them. Dare to be different. You are your own boss, you can do what works for you. If you want to use an idea that another entrepreneur is doing, that’s fine, just make it “YOU”. It needs to reflect you and your brand, otherwise, why should we follow you? You are offering exactly what the next person is. If you are different, people will always follow you because you have something different to offer. Do you ever wonder why so many of Beyoncé fans are ready to purchase her concert tickets (even though she barely promoted it to start with)? Or her latest CD or perfume? She knows her audience and knows what they want. She is simply delivering what they asked for and they are ready to buy whatever she has to offer from the very first day. Her “Beehive community” are her loyal fans, they are engaged and they believe in the products she has to offer. That’s how she gets away with little to no promotion prior to a release of a product. O'm pretty much telling you to get your own Beehive fans from social media and into your mailing list. If you're uncertain of what your audience wants, send them a survey to see what their struggles are. Beyoncé is known for getting people to talk about her. One thing is for sure, you never know what she is up too. When Beyoncé released her album “Beyoncé”, no one was expecting it. Well- Beyoncé dropped an album with no warning and it reached number one on the charts with not an ounce of marketing. Who releases a product with no marketing? Another surprise element was when she announced her pregnancy at the Much Music Awards. That left me in utter shock (her fans anyways). People all over the world were tweeting, Instagramming, reposting on Facebook and on every social network known. In other words find a way to get your fans to talk about your business and your brand. This is how to market and brand your business like Beyoncé. Doing it big and strategic or not doing it at all. As we now know it, Beyoncé likes to surprise her audience in any way possible from business releases to personal announcements. This is the best on how to market and brand your Business like Beyoncé as you prepare to launch. Trust us, she would not be able to do this if she did not have a loyal community behind her brand. Would you really purchase something from a nobody? I doubt it. Beyoncé has built a great community over the years and that is how she is able to get the results she is getting with little to no marketing. If your great mind has come up with an awesome idea, try to keep it to yourself until you are ready to release it. Otherwise, someone else will steal your idea and release it before you get a chance to do so. Doesn’t mean you can't offer small hints here and there for the sake of promoting. For example: “stay tuned, new product/service coming your way soon”. Or blogging about something that will eventually lead to your grand release. Another way is creating a sales funnel that will lead your client to a final product. Beyoncé knows how to work hard but she also takes time to enjoy quality time with family and friends. All your hard work deserves some Beyoncé fun. Go ahead and put some music on and dance with your family. Have you considered what changes you can make to brand your business? These are all just a few little steps to branding your business like Beyoncé. As entrepreneurs, every little thing that we do can have a direct effect on our business. Consistency is key and giving your audience exactly what they thirst for will keep your business afloat. By the way - what's your favourite Beyoncé song? It's "Halo" for me. Pretty much sums up the love I have for my husband and the feelings that emerged after countless heartbreaks.